San Francisco, CA, August 8, 2018 – VIZ Media, LLC (VIZ Media), a premier company in the fields of publishing, animation distribution, and global entertainment licensing, announces the release of the new manga series RADIANT on September 11th. RADIANT is a supernatural action and adventure series created by French-born artist and writer Tony Valente. A Japanese-produced anime adaptation of Valente’s manga will premiere this fall. RADIANT is rated ‘T’ for Teens and will be published in print with an MSRP of $9.99 U.S. / $12.99 CAN. The series also launches digitally on September 11th via viz.com and the VIZ Manga App, and will be available from the Nook, Kobo, Kindle, iBooks, comiXology, and Google Play stores. Volume 1 features 8 full-color pages. Future volumes of RADIANT will be published by VIZ Media on a bimonthly basis. In RADIANT, evil creatures called Nemeses fall from the skies and the only ones who can fight them are Wizards—infected ones who survived a Nemesis's corruption. Seth, one of these survivors, vows not only to fight the Nemeses, but to find their mythical nest, Radiant, and destroy it! RADIANT creator Tony Valente began working as a comic artist with the series The Four Princes of Ganahan written by Raphael Drommelschlager. He then launched his own three-volume project, Hana Attori, after which he produced S.P.E.E.D. Angels, a series written by Didier Tarquin and colored by Pop. 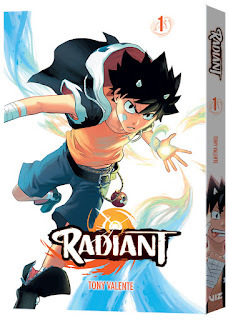 For additional information on RADIANT and other manga titles published by VIZ Media, please visit viz.com.